What is the Pharynx and Tonsils? The pharynx is the uppermost part of the alimentary tract and commonly referred to as the throat. It directs the passage of air and food between the mouth and nose into esophagus and larynx. The tonsils are collections of lymphoid tissue that lie in the pharynx. It starts from the back of the mouth and nose and extends down into the esophagus. It runs from the base of the skull to the inferior border of the C6 vertebra, which is posterior to the pharynx, and the cricoid cartilage, which lies anterior to the pharynx. The pharynx has three functions based on the cavities which lies adjacent to it. The nasopharynx is an extension of the nasal cavities and directs air downwards during inhalation and upwards during exhalation. The oropharynx extends from the back of the mouth and carries ingested food and drinks from the mouth into the esophagus. 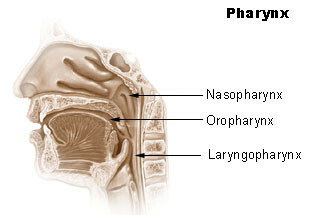 The laryngopharynx lies just behind the larynx (voice box) and is the lowermost part of the pharynx. It serves as a common passage for both food (into the esophagus) and air (into the larynx). The pharyngeal tonsil is located in the mucous membrane lining the roof and posterior wall (back wall) of the nasopharynx. It is commonly referred to as the ‘adenoids‘ when inflamed. The tubal tonsil is located in the submucosa of the nasopharynx near the opening of the eustachian tube. The palantine tonsils lie on either side of the oropharynx in between the palantine arches. 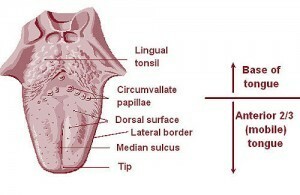 The lingual tonsils are located at the back of the tongue. The tonsils form a ring on lymphoid tissue which is referred to as the pharyngeal lymphatic ring (tonsillar ring or Waldeyer’s ring). 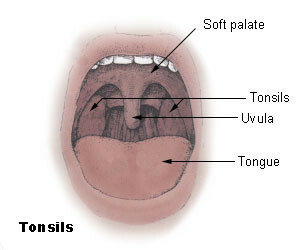 The tonsils are collections of lymphoid tissue which are part of the pharynx. It has many immune related functions. However, the tonsils are not the only lymphoid tissue in the body and therefore many of its functions are handled by other parts of the body’s immune system. The tonsils may have the following functions. It produces lymphocytes (white blood cells) which play an important role in fighting infections as part of the body’s immune defenses. It traps and neutralizes invading pathogens that may enter through the mouth and nose. It plays a role in allergic mechanisms (immune mediated hypersensititvity). It monitors the air, food and fluids that enter through the nose and mouth and may trigger localized and even systemic reactions in response to certain compounds.